She actually served the Beatles there. That is cool! What were her impressions, if you recall? I also remembered going up on the roof at Idlewild airpot. I also remember when the TWA terminal was actually a terminal, and as I recall, the American Airlines terminal was like all colored mosaic tiles on the front. My mom worked at the International Hotel, which was the only hotel actually on airport property, but now just an empty shell, as a waitress. She actually served the Beatles there. At the international arrivals building you could look down at the passengers going through customs, from above. 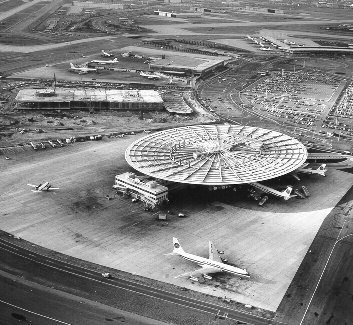 The Pan Am "worldport" - man was that style ! I hoped as a child that's what the new lunar port would look like in a few years. What a disappointment the "future" became. Except for Concorde, and that's gone too. I have a new split windshield, but my insurance company insists I'm not covered for that. There is a Idlewild golf course in Greater City of Sudbury Ontario Canada!!!!! Oh yeah, Idlewild lost in time! I remember that episode of The Twilight Zone. When they tried to land, the place was covered in dinosaurs. Starring John Anderson. "There's a scout troop short a child...Khruushchev's due at Idlewild...There's a whole BUNCH of generations that have NFI WHAT "Idelwild" is or was!!! I remember being able to go up one the roofs of the terminal buildings to watch the airplanes. Yes, it was legal then.